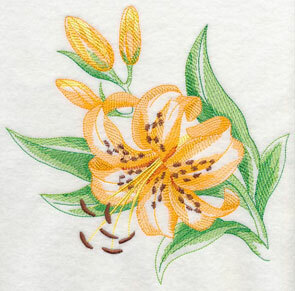 This weekend, light and lovely flowers bloom with color in an all new Embroidery Encore! 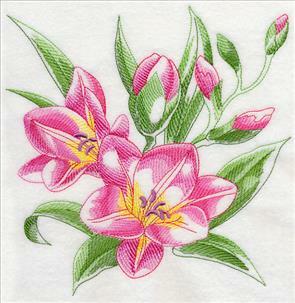 Brilliant blossoms come alive in softly sketched arrangements and in single flower designs. 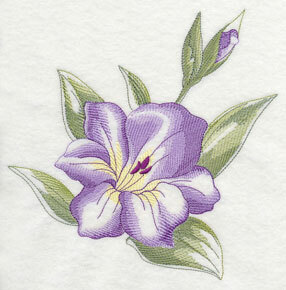 Bring the glories of the flower garden to your embroidery machine with gladiolus, impatiens, sunflowers, marigolds, cosmos, and many more fabulous varieties. 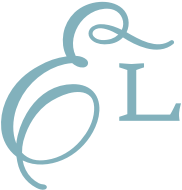 Scroll down to see these lovely designs! 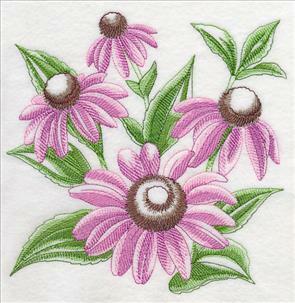 Stitch a garden of beauty with light and lovely flowers! 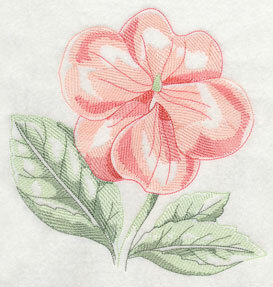 Light and lovely floral sketches seem to glow with sunlight. 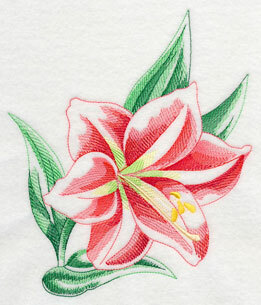 Subtle shading and gorgeous colors create impressive realism on petal and leaf alike. 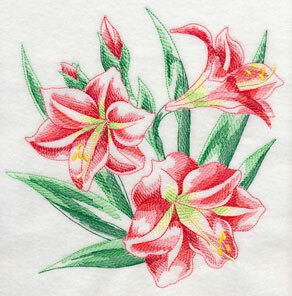 Plant a lovely amaryllis and a cheerful camellia on pillow covers and table linens for a fresh addition to summer decor! 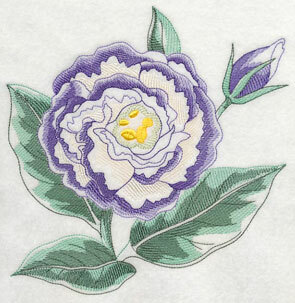 Each type of flower appears further down the page in single flower designs as well. 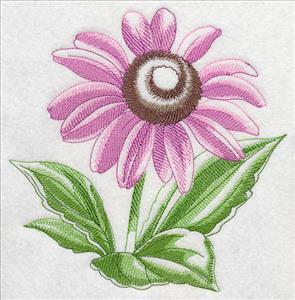 7.80" x 7.77" and 6.92" x 6.90" and 5.87" x 5.85" and 4.87" x 4.85" and 3.85" x 3.83"
Tote bags, book bags, and knitting bags are natural places for these bright flowers to bloom. 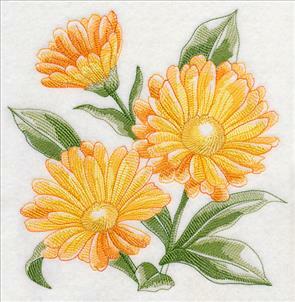 Stitch fragrant freesia and charming calendula for eye-catching embellishments in any season. 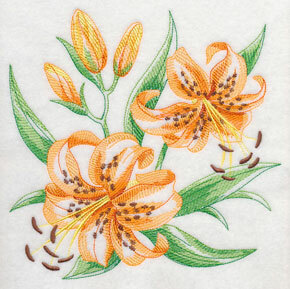 7.79" x 7.80" and 6.89" x 6.90" and 5.87" x 5.88" and 4.87" x 4.88" and 3.87" x 3.88"
Tiger lilies are a common sight in many places, but their striking appearance is anything but commonplace. 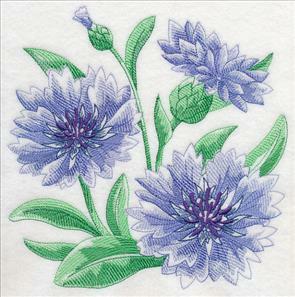 Bring their exotic beauty to your embroidery projects! 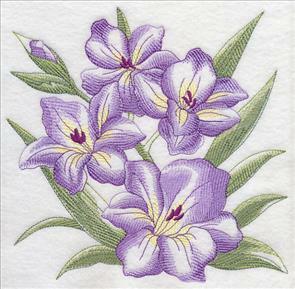 And let gorgeous gladiolus gladden your heart on flat- and low-nap towels. 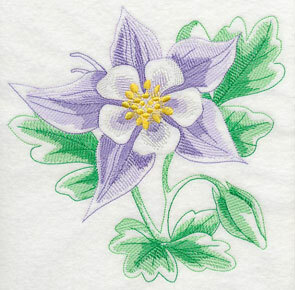 7.78" x 7.75" and 6.89" x 6.87" and 5.86" x 5.84" and 4.87" x 4.85" and 3.87" x 3.86"
Distinctive columbine and sunny dog roses make lively additions to shirts and skirts. Bring their effervescent color to your wardrobe, and create a unique style unlike any found in a store. 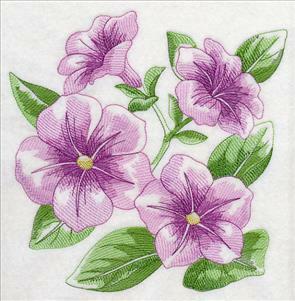 7.80" x 7.80" and 6.90" x 6.90" and 5.85" x 5.85" and 4.85" x 4.85" and 3.85" x 3.85"
Whether you call them impatiens, jewelweed, touch-me-not, snapweed, or "busy lizzie," everyone calls them lovely! 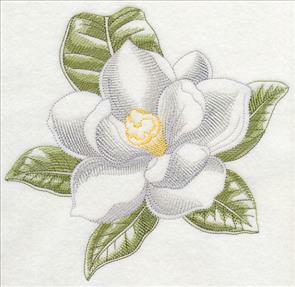 Stitch them onto a pillow cover, then plant the luxurious magnolias on another pillow sham for a coordinating pair of stunning beauty. 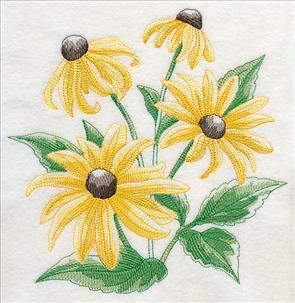 7.78" x 7.78" and 6.87" x 6.87" and 5.85" x 5.85" and 4.86" x 4.86" and 3.86" x 3.86"
Petunias and black-eyed Susans are beloved favorites in many gardens. 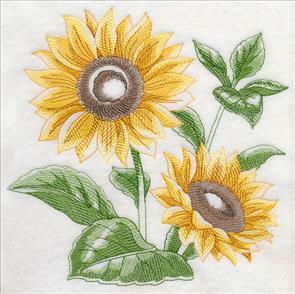 Bring their cheerful faces to your embroidery projects! 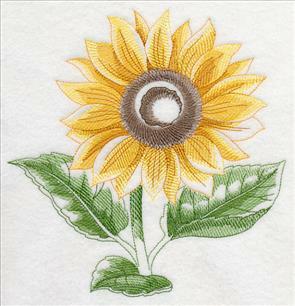 7.80" x 7.84" and 6.90" x 6.93" and 5.85" x 5.88" and 4.85" x 4.87" and 3.83" x 3.85"
Instantly-recognizable sunflowers and elegantly blooming lisianthus are fairly bursting with natural charm! Lisianthus are actually native to the American prairie, and sunflowers bloom abundantly in prairie settings, too. 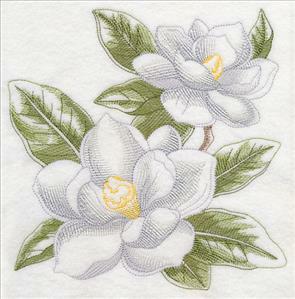 Let them bloom on table runners, napkins, placemats, and more for dining decor as fresh as a summer breeze. 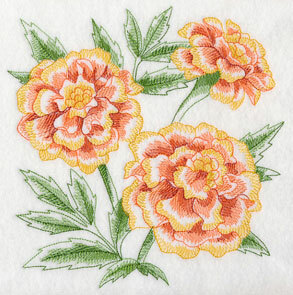 7.76" x 7.78" and 6.88" x 6.90" and 5.85" x 5.86" and 4.85" x 4.87" and 3.86" x 3.87"
Sweet peas were the floral sensation of the late Victorian era, and marigolds are perennial favorites today for their brilliant color and hardy natures. 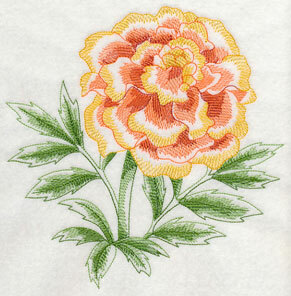 Bring them to life on quilts and wall hangings for summer color that will last all year long. 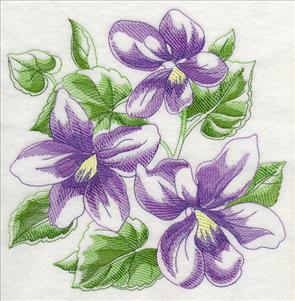 7.63" x 7.80" and 6.90" x 7.05" and 5.87" x 6.00" and 4.85" x 4.96" and 3.77" x 3.85"
Stitched flowers thrive in all conditions -- sunny, shady, dry, sandy -- and their petals never drop, meaning anyone with an embroidery machine has a natural green thumb! 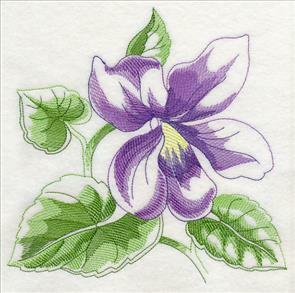 Tuberous begonia and clematis are lovely additions to market bags and kitchen towels. 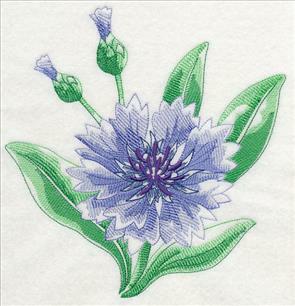 7.48" x 7.78" and 6.88" x 7.16" and 5.89" x 6.13" and 4.89" x 5.08" and 3.72" x 3.87"
Cornflower and cosmos add bright color to aprons, zippered bags, and everything in between! 7.78" x 7.76" and 6.90" x 6.88" and 5.86" x 5.85" and 4.86" x 4.85" and 3.85" x 3.84"
The "square" shapes of these bouquets is a perfect fit for the sides of tote bags and pillow covers. 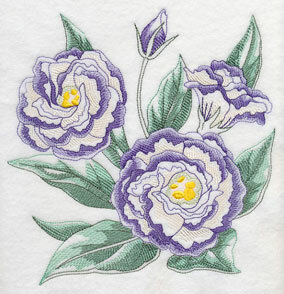 Pick your favorite flowers and plant a fresh floral embellishment on summer projects. 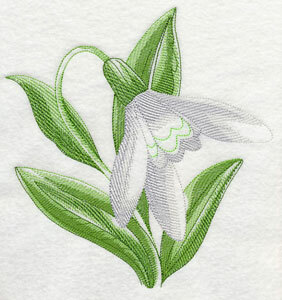 7.78" x 7.80" and 6.90" x 6.91" and 5.85" x 5.86" and 4.85" x 4.86" and 3.84" x 3.85"
Snowdrops are one of the few plants that bloom in winter, while purple coneflower bloom throughout spring to late summer. 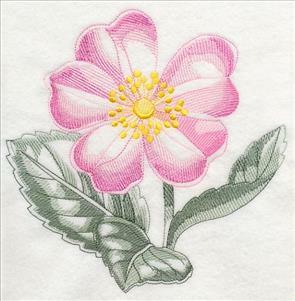 Both blossom year-round on mini-quilts and wall hangings! 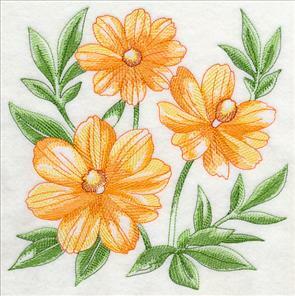 7.79" x 7.80" and 6.90" x 6.91" and 5.84" x 5.85" and 4.85" x 4.85" and 3.85" x 3.85"
Stitch a lively flower garden with the Light and Lovely Floral Sketches Design Packs! 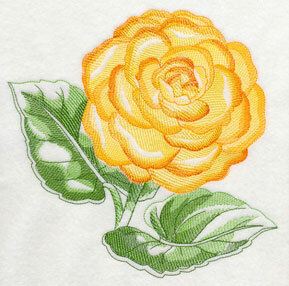 Tote bags, towels, quilts, linens, apparel, and more will bloom with color with fresh flower designs. Order the designs individually by clicking the links above, or get the pack with all 24 designs. Five sizes are available to suit any project. 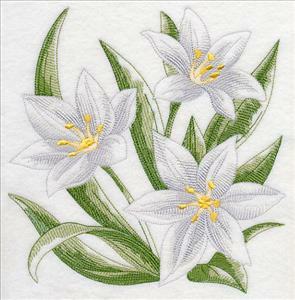 The flowers in the arrangements above are also available in single flower designs. 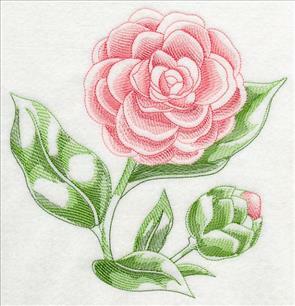 One glorious blossom in full bloom showcases the dramatic natural beauty of each flower presented here. 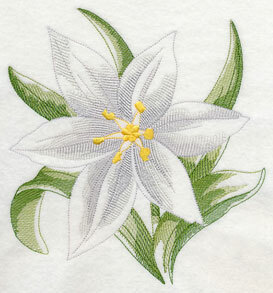 Add magnificent color and a realistic impression to pillow covers, tote bags, quilts, table linens, towels, shirts, and more with a lovely amaryllis and a fresh camellia. 7.55" x 7.80" and 6.90" x 7.13" and 5.85" x 6.04" and 4.85" x 5.01" and 3.72" x 3.85"
It isn't summer without fresh flowers, and a freesia and calendula make a delightfully refreshing color combination on towels, pillow shams, placemats, tote bags, and more. 7.47" x 7.80" and 6.90" x 7.20" and 5.85" x 6.11" and 4.85" x 5.06" and 3.69" x 3.85"
Pastels never look so good as they do on a tiger lily and a gladiolus. 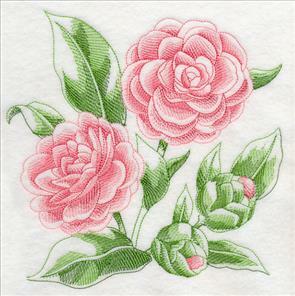 Add delicate yet vivid color to mini-quilts, wall hangings, and framed embroidery for resplendent home decor. 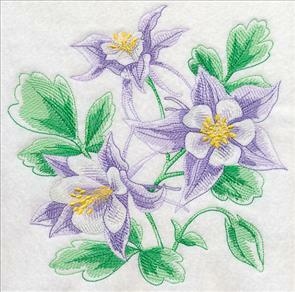 7.79" x 7.80" and 6.90" x 6.91" and 5.89" x 5.89" and 4.85" x 4.85" and 3.85" x 3.85"
Columbine and dog roses bring their own sunshine to the party, with dazzling golden centers. 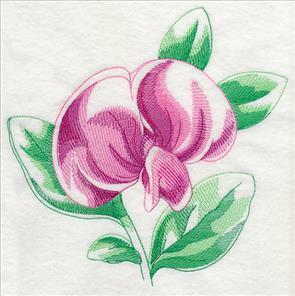 7.74" x 7.80" and 6.90" x 6.95" and 5.86" x 5.90" and 4.85" x 4.88" and 3.82" x 3.85"
Impatiens are small in size but big in good looks, and a magnolia brings a taste of the romantic south to your stitching no matter where you live. 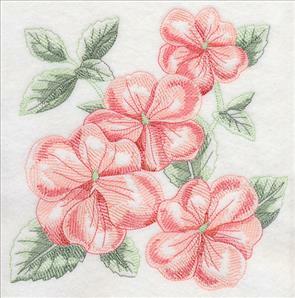 Gorgeous on summer shirts! 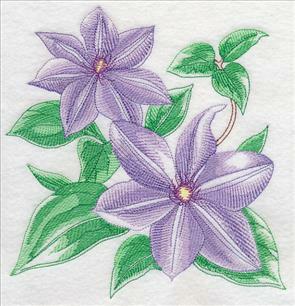 7.78" x 7.43" and 7.20" x 6.88" and 6.11" x 5.83" and 5.07" x 4.84" and 3.88" x 3.71"
Flowers bloom for such a short time. 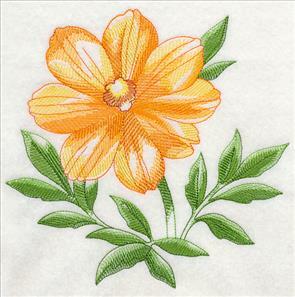 Luckily, embroidered flowers never fade! 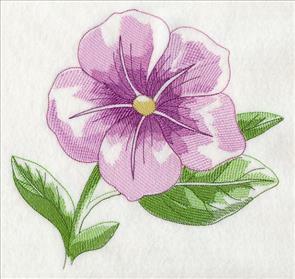 A petunia and a black-eyed Susan provide enjoyable color all summer long and beyond. 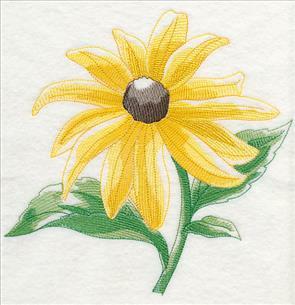 7.78" x 7.74" and 6.91" x 6.88" and 5.84" x 5.82" and 4.85" x 4.83" and 3.87" x 3.85"
Trivets are a wonderful place for a sunflower to bloom, and a lisianthus is perfect for a summertime placemat. 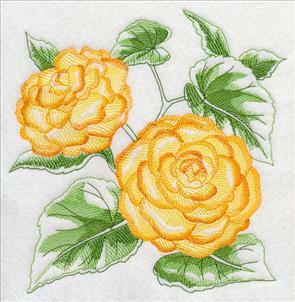 Both flowers are lovely anywhere you stitch them. 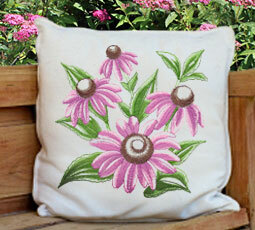 Let your imagination blossom with all the fabulous places for your flower garden to grow. 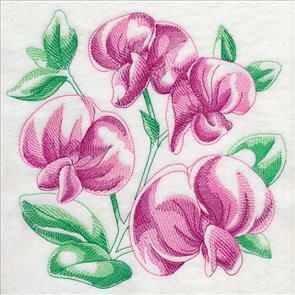 7.65" x 7.78" and 6.88" x 7.00" and 5.83" x 5.93" and 4.84" x 4.92" and 3.79" x 3.86"
Stitch a sweet pea for your sweet peas, then add a bright marigold for extra pizzazz! 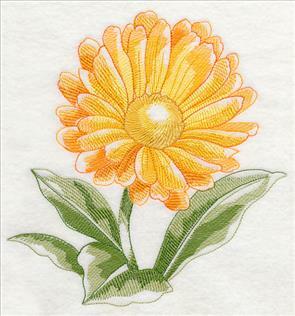 7.75" x 7.79" and 6.88" x 6.92" and 5.85" x 5.88" and 4.86" x 4.88" and 3.85" x 3.87"
Choose your favorite flowers and stitch onto cloth napkins for a graceful addition to any table. 7.78" x 7.44" and 7.19" x 6.88" and 6.10" x 5.83" and 5.06" x 4.84" and 3.85" x 3.68"
Blue skies and orange marmalade come to mind with the amazing color in cornflower and cosmos blossoms. 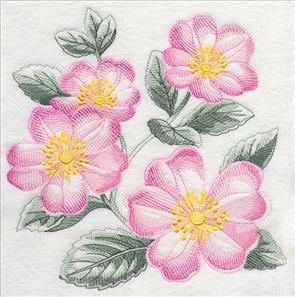 Bring a kitchen to life with these brilliant beauties on flour sack towels. 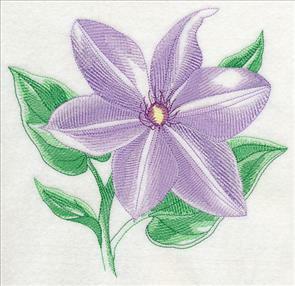 7.78" x 7.55" and 7.09" x 6.88" and 6.04" x 5.86" and 5.01" x 4.87" and 3.87" x 3.76"
Pick a pretty violet and an elegant star of Bethlehem for projects as fresh as morning dew. 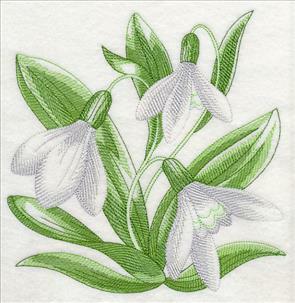 7.65" x 7.80" and 6.90" x 7.04" and 5.88" x 6.00" and 4.86" x 4.96" and 3.78" x 3.85"
A snowdrop blossom imitates the downward movement of falling snow, while a purple coneflower signifies summer with all its warm breezes and warmer sunshine. 7.67" x 7.80" and 6.90" x 7.02" and 5.87" x 5.97" and 4.85" x 4.93" and 3.78" x 3.85"
Stitch a rainbow of color with the Beauty in Bloom III design packs! 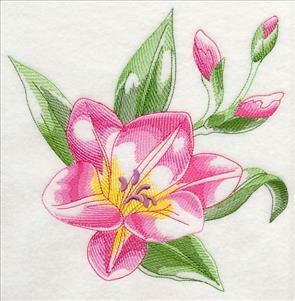 Single flowers shine with radiance in designs made to blossom on decor, apparel, and more.